Want to get high conversion rates on your pay per click advertising campaigns? 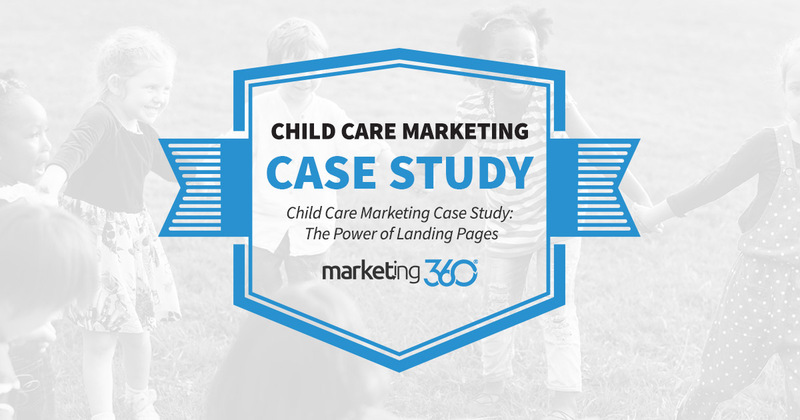 Then do what this Marketing 360® child care marketing client does. Use landing pages. Landing pages deliver. They deliver the exact content searchers expect to see when they click an ad. And they deliver strong conversion rates for businesses. A landing page matches the message of the ad. It’s designed to provide a seamless experience so searches are immediately oriented. At the top, visitors know right away they’ve found the right service in the right place. They can make a call or schedule a tour right away. Or they’ll scroll down and enjoy further edifying content that includes an introductory note from the director, rates, and customer reviews (including video testimonials). Many businesses make the mistake of using their homepage, with general branding and info, as their only landing page. This never converts as well if you need to match the ad with specific messaging for an offer or location. It takes more effort to build out landing pages (effort Marketing 360® makes on behalf of this business), but the payoff is worth it. Learn more about creating landing pages.